Recognizing the region’s need to scale up the naval science and engineering workforce, URI and UConn teamed up to create a major regional workforce initiative directed to undergraduates. The Southeast New England Naval STEM Coalition leverages resources at the two campuses and draws on industry and navy partners to deliver naval-relevant training. The Navy STEM Coalition gives students opportunities to investigate hands-on naval science and technology challenges. 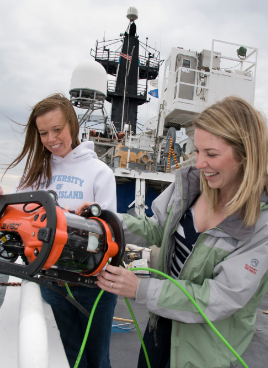 Two undergraduate students from URI’s Department of Ocean Engineering test a small remotely operated underwater vehicle onboard the Research Vessel Endeavor.